TSI 9555-X Indoor Air Quality Meter Rental | Enviro-Equipment, Inc.
Includes IAQ 982 Probe: relative humidity (0 - 95%), temperature (14 to 140°F), carbon monoxide (0 - 500 ppm), and carbon dioxide (0 - 5000 ppm). Datalog 26,500+ samples and 100 test IDs, user configurable intervals from 1 second to 1 hour. Includes TrakPro Data Analysis Software for data download, organization, reports and graphs. Powered by 4 AA batteries or AC adapter. 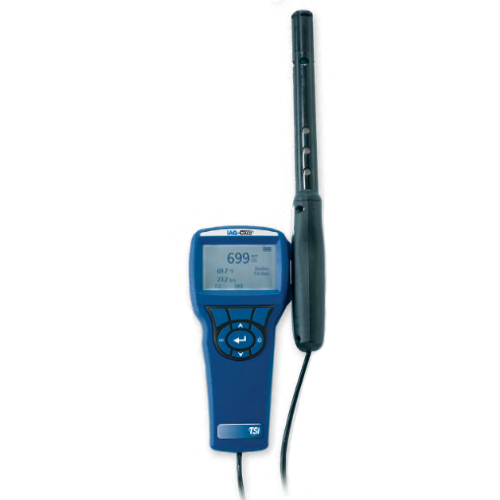 The 9555-X Multi-Function Meter is a portable, hand held test instrument design for many different applications, including indoor air quality measurements. Our rental units are outfitted with the 982 IAQ Probe to measure temperature, relative humidity, carbon monoxide (CO) and carbon dioxide (CO2). Multiple datalogging options are available on the meter, including continuous or manual logging.